If you put your ear next to it can you hear a slight hum? Sorry, couldn't resist! Hope VTI takes care of you on this. I wouldn't "bend" anything! (Loss of warranty). Send back for replacement or refund! Shouldn't have to bend it to make it right! Just very poor quality control. It can happen to any company (even though it shouldn't) what they do will speak volumes as to the company. I hope everything works out or you get a refund......... Its not good spending a lot of money on "cheap". 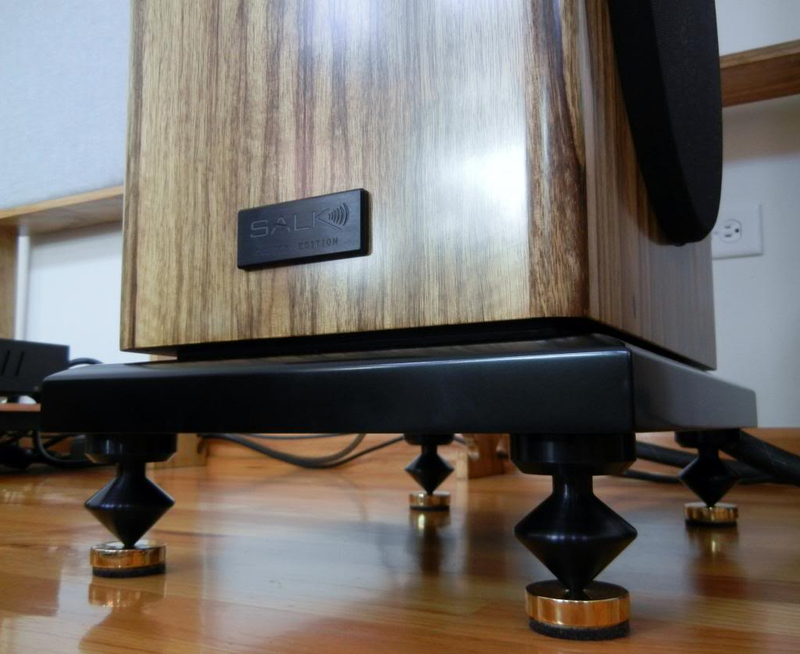 But if you decide to spend a lot less for "cheap" check out this Sanus rack. 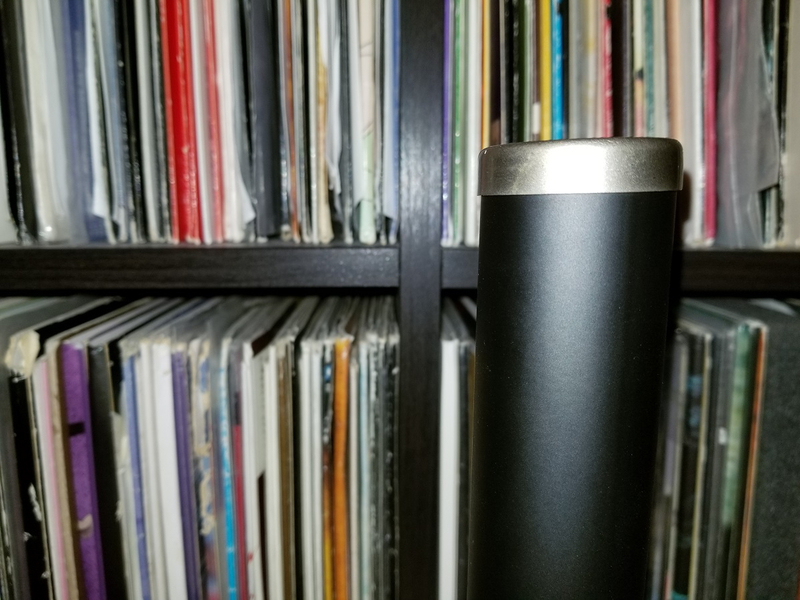 Its only $120 shipped, can hold 200 lbs, and gets good reviews on Amazon. I know it is bare bones and not even close to most of the racks mentioned but it doesn't look too bad (at least to me). I just ordered one last night (before I looked at this thread). If anyone wants an update I will let you know when it gets here. Read the earlier post where the manual/instructions suggest using a mallet. That's terrible QC. I don't think you are being too picky. I wouldn't accept that. It seems VTi has gone cheap on the cups. Why isn't that common knowledge now? Do the older VTi stands have welds on top of the cross bars? I also believe VTi could include a 2.00 rubber mallet in one of the boxes so somebody doesn't have to go to the neighborhood hardware store or grocery store either. I've seen rubber mallets in the 3' wide hardware display at Harris Teeter here. @helipilotdoug is on the case for Drew folks. I'm sure we'll be hearing good news soon. Doug stands behind his products and the products he offers to his clients. I'm sure that this will be no exception. My first VTI rack was the double wide. Over the years I may have exceeded max weight and had point punch through on eight caps. I contacted VTI and they sold me replacement caps. I replaced the punctured caps before I sold the rack. 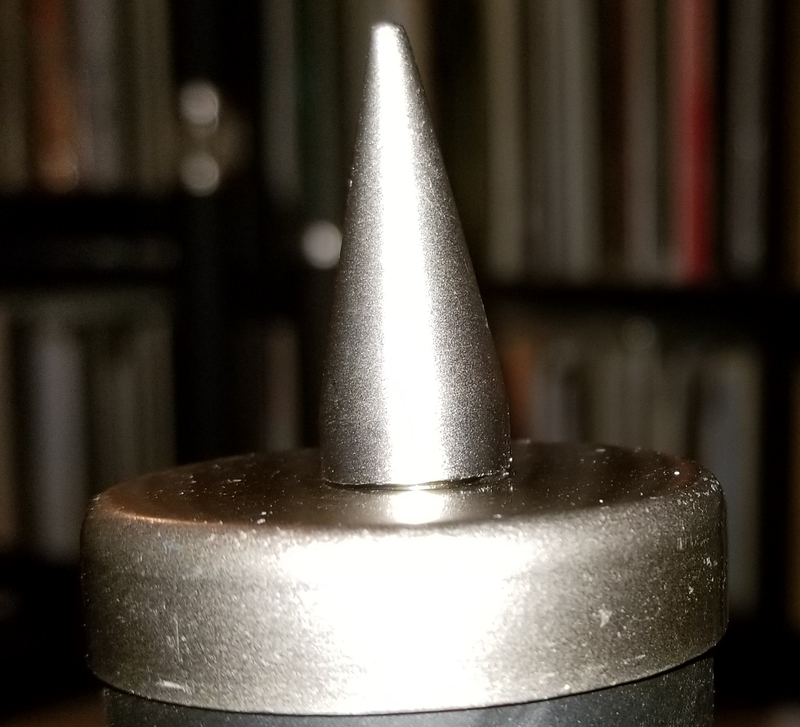 I needed some large diameter spike pads for my speakers. I used a hole saw and drilled some hardwood discs. I glued the wood discs into the older VTI caps and added heavy duty adhesive felt on the bottoms. 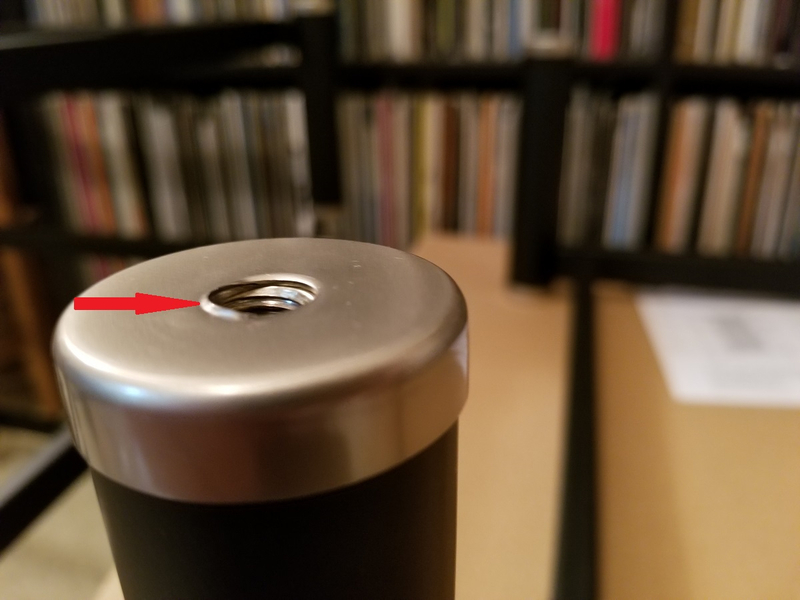 They are thicker than the caps on newer racks, as mentioned and are holding up well. Speakers are ~ 130 pounds. I wouldn't do this with the newer caps. Hey Kerry, you are right. On this one particular shelf section, the caps aren't fully installed and seated on the ends of the tubes. Additionally, there are small raised lips of metal on the end of the screw holes that you screw the spikes into. As a result, the spikes can not sit fully flush with their mating surface, instead they bottom out against the small lip of metal. This is what is making them skewed off at an angle like I tried to illustrate in the photos. Lastly, some of the spikes themselves just don't seem to be true and straight. I would notice with varying degrees of severity, that when I would screw them into the holes, the pointed end would be rotating in the air and making a circle. This means they weren't tooled correctly when they were made or when the threads were cut into them. This is slightly disappointing because I feel like I could get higher quality nuts and bolts for .30 cents each down at the local hardware store. @Clipdat It looks like the end caps aren't seated properly. As if they went in slightly [email protected] eyed and aren't seated flush thereby throwing off the projection of the spikes, or, the receiving cup. Might try taking the spike out and lightly tapping with a mallet, or dead blow, to see if they seat properly. Should use a piece of sacrificial wood covered in tape to keep from marring the surface. Your comment, and others, seem to imply that the caps are removable somehow. I'm not sure if they changed the design from how they used to be, but the caps are stuck on there and aren't going anywhere. They aren't just sitting loosely on top of the legs. I wouldn't be surprised if they were welded or glued or something. There is no budge or give to them. That being said, it would be really difficult to try to get the legs all aligned by eyesight. As far as the overall alignment of the unit, I would defer to the factory workers who are making/welding these to ensure that. They're all based off of a master jig, so really any abnormal fitment or things that are out of tolerance is the fault of the assembly worker. I agree that the caps are not fully seated. But I think the bigger problem is the legs are not aligned. I would try and remove all of the endcaps and bend the legs till they are aligned with each other. Then place one on top of the other to check the fit and make sure the legs match up perfectly, it looks like yours are 1/8 - 1/4 inch off. And be careful bending! When everything lines up seat the endcaps fully with the mallet and wood. Thank you, sir! PM replied. I think I just need a new 7" shelf that hopefully is up to their standards. Drew, I'm sorry to hear you have problems with the racks. I'll get with VTI today and see what they will do about this. I have never had any problem with alignment like this in the past with VTI racks. Sending you a PM about this. It really blows spending the time putting it together only to find out that you're going to have to take it back apart and send it back then reassemble another one. I realize that's likely thing when I order something like this. Like someone mentioned before, I believe when you finally get it squared away you'll have about the best rack at that price point. They seem to jump up considerably from there, so, I think it's a good buy. Doug seems to be all over it, so that's a positive. 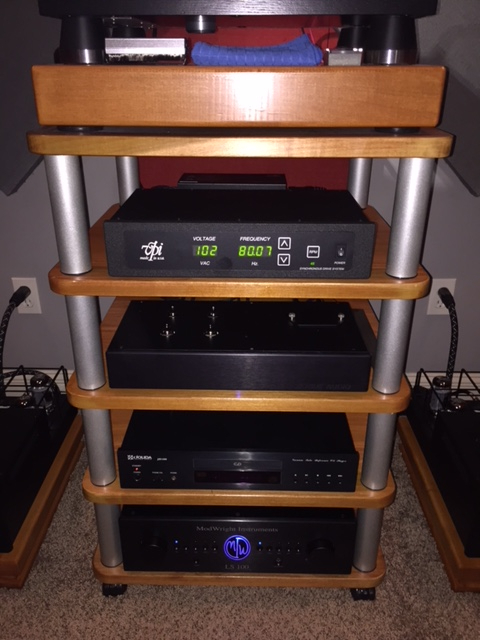 I've suffered through several cappy racks/stands and decided with the system I'm putting together is likely end game, so, I want a worthy piece of furniture for a rack. I haven't been able to bring myself to let go of the monet yet. It's killing me to do it. Somewhere in my mind the thoughts of "go get some cinder blocks and 2x12's!" Due to the modular nature of the design, it might not be necessary to send the entire unit back. 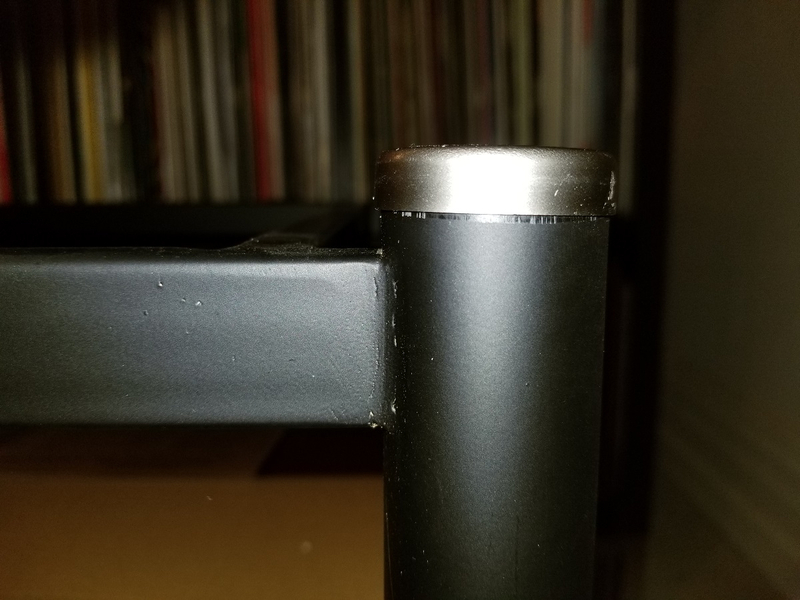 I believe I'd be satisfied with just a replacement 7" shelf that isn't as wonky as this particular one. From a shipping costs perspective, it's probably not even worth it for VTI to pay to have "defective" pieces returned. @Clipdat, I thought you had to pop those caps onto the legs. I agree 100% that they should never had left the factory installed like that. I think they must've changed the design and/or the way they are made. I just went and tried to pry, pull, and yank at one of the caps until my fingers were red and painful. It's fully stuck on there and isn't budging. My VTI caps won't come off either, I would probably damage them if I try any harder to remove the caps. Hi @clipdat just got home looking at this thread. Wow! Hey a good way to know if the legs are not perfectly true is to measure the diagonal distance from pole to pole. They should be identical. This goes for every shelf. 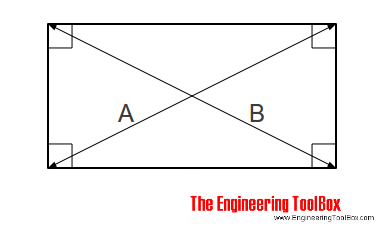 Measure the ends with the welded parts, then compare to the free ends. They should match. 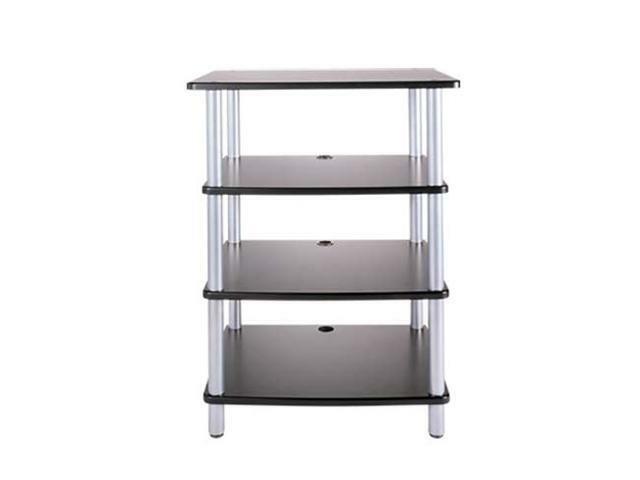 I have an older version of this rack (without the wire holes in the back) and really like it. Serves it's purpose quite well. 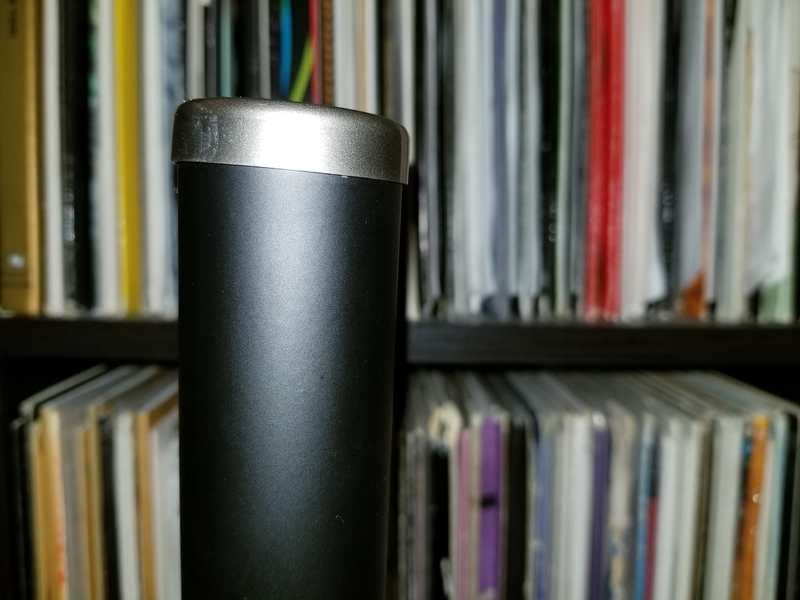 I just ordered 12 inch replacement bars for the bottom shelf, as Zach's old amp doesn't fit in the 8 inch space provided. Update: VTI will be shipping me a new 7" frame section. Thanks so much @helipilotdoug for following up with VTI on my behalf and taking care of this for me. I literally did not have to lift a finger, as soon as @helipilotdoug saw my posts he was in touch with VTI and getting the ball rolling on a resolution for me. That's great customer service! Thank you! Thanks for the kind words Drew. I'll send you tracking once VTI sends it to me. Thank you! I'll post up some comparison pics when it arrives. 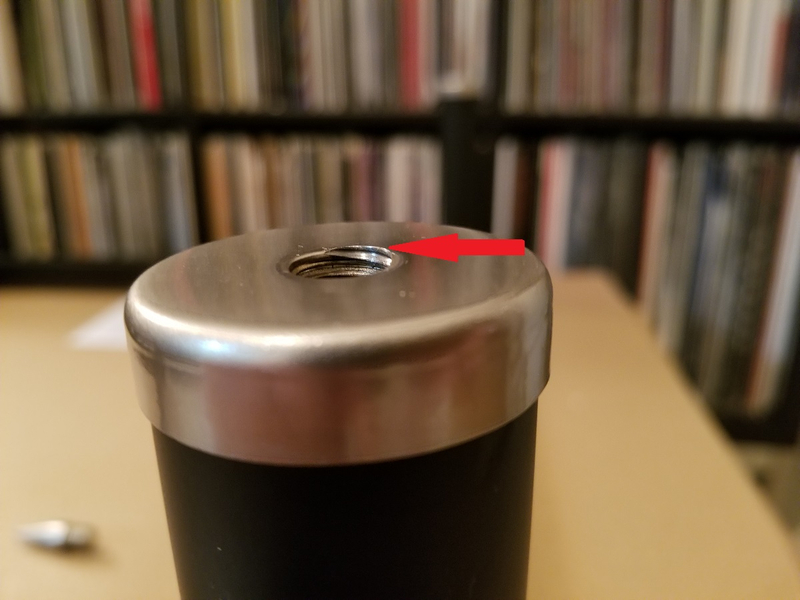 I'll be looking to see if the replacement has fully installed/flush endcaps, and no thread burs sticking up raising the surface where the spikes screw into, making them sit askew. Keeping my fingers crossed that this frame will be much better! Now let's take a look at the new frame and see how it looks. 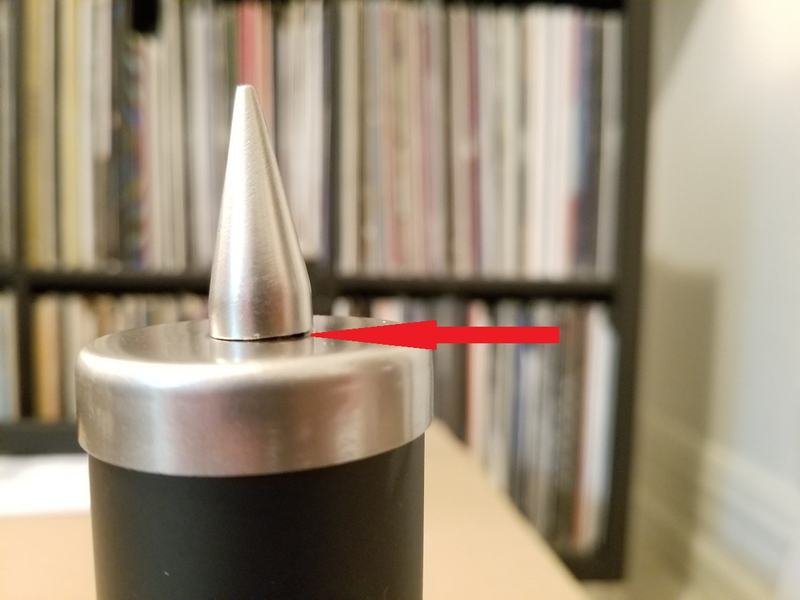 I don't own a "rubber mallet" so I can't try that, but I don't know what else to do about the alignment issue, and the issue with the thread burs making the spikes come out at a skewed angle. I guess I'm just either having really bad luck, or the quality is not meeting my expectations. 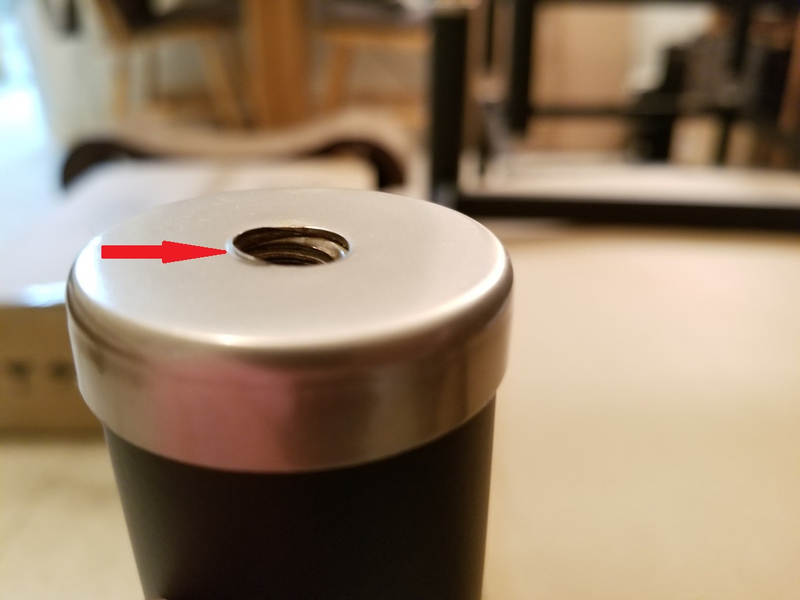 Perhaps you could use a Dremel or something similar to remove the burr? Maybe that will get you close enough for the spike to seat in the cup even with the caps not being true? I don't own a Dremel. And the issue of the spikes not being aligned with their recessions is due to the alignment of the frame itself, it's an independent issue from the spike issue. have you placed a piece of equipment on the shelf? the weight bows the frame and the spikes should fall in place. Yeah, I remember you or someone else mentioning this. 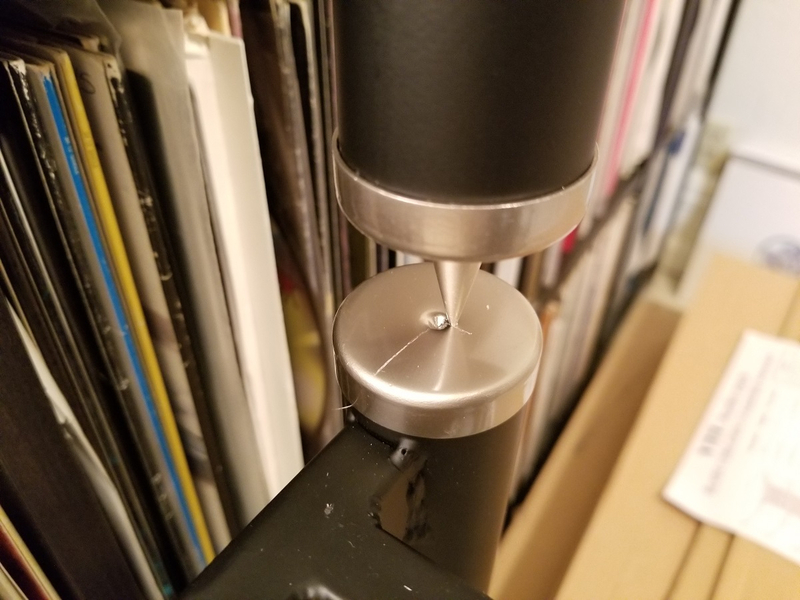 I did not actually place a piece of equipment on the shelf, but I simulated doing so by pressing down firmly on it and seeing if it would fall into place. One spike did, the other still did not. I'm kind of thinking like Marvin, I believe that if you put some weight on it things will line up. You could put a piece of tape, or cloth, over the burr and tap lightly with a regular hammer to knock the burr down. 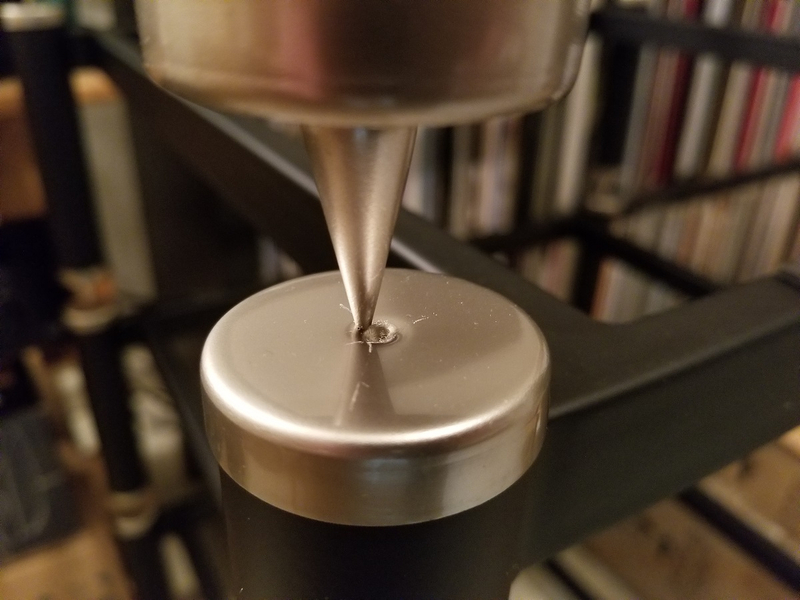 To be more precise, you could use a bolt as a "set" and place the tip of the bolt on the burr and then hammer the head of the bolt thereby knocking the burr down.